1 Standard King Bed, Large Living Room, Dining Room, Full Kitchen, Powder Room, Over-sized Bath with Jacuzzi Tub and Shower, Internet, Flat Screen TV, Jacuzzi. 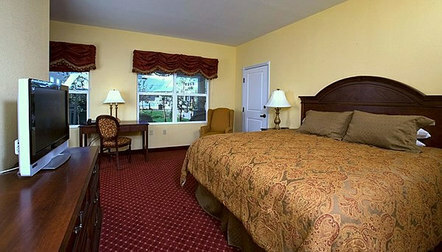 900 sq ft.
***Suite room not picture but similar to 2nd floor Clubhouse photo below. We also have the Clubhouse Inn Suite on 2nd floor reserved to gather as a group!